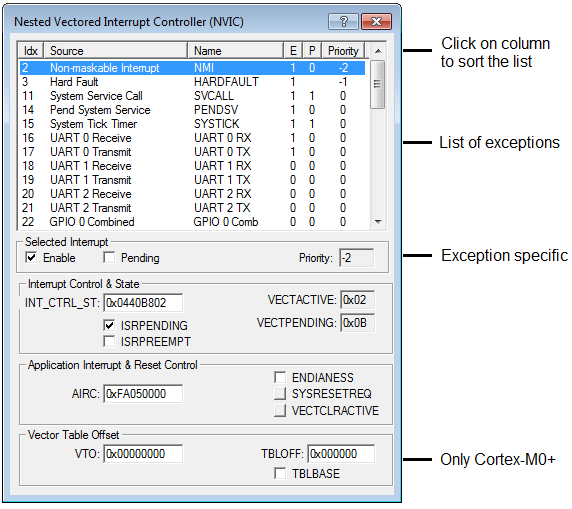 The Nested Vectored Interrupt Controller dialog (for Cortex-M0 and Cortex-M0+) shows the status of all exceptions. For each exception, the dialog shows the number, source, name, state, and priority. This group shows exception-specific controls. Enable Enable (NVIC->ISER) or disable (NVIC->ICER) the selected exception. For some exceptions, this is read-only. When unchecked, the exception cannot be taken. This control corresponds to the column E in the list. Pending You can manually trigger an exception by setting this (NVIC->ISPR) For some exceptions, this is write-1-only. Note that an exception can get into the state pending, though it is disabled. This control corresponds to the column P in the list. Priority Shows the priority of the selected exception. Can be set manually for user-defined exceptions. This control corresponds to the column Priority in the list. For system exceptions, the register NVIC->IP is written, while for user defined exceptions the register SCB->SHP is written. Inactive - The exception is not active and not pending. Pending - The exception is waiting to be serviced by the processor. An interrupt request from a peripheral or from software can change the state of the corresponding interrupt to pending. Active - An exception that is being serviced by the processor but has not completed. An exception handler can interrupt the execution of another exception handler. In this case, both exceptions are in the active state. Active and pending - The exception is being serviced by the processor and there is a pending exception from the same source. Provides a set-pending bit for the Non-Maskable Interrupt (NMI) exception. Provides set-pending and clear-pending bits for the PENDSV and SYSYTICK exceptions. Shows the exception number of the highest priority pending exception. INT_CTRL_ST Content of the ICSR in Hex. ISRPENDING Exception pending flag. Shows that at least one exception is pending, excluding NMI and faults. ISRPREEMPT The next pending exception becomes active. VECTACTIVE Number of the active exception. VECTPENDING Shows the number of the enabled exception with the highest priority that is pending, including NMI and faults. The AIRCR at memory address 0xE000ED0C provides endian status for data accesses and reset control of the system. AIRC Content of AIRCR in Hex. Default value is 0xFA050000. ENDIANNESS Shows the significant byte order of a word. Is read-only. When unchecked = little-endian; when checked = big-endian. SYSRESETREQ Click to raise the external signal for reset. Always reads as zero. VECTCLRACTIVE Click to clear state information. Only available for Cortex-M0+. Is an optional register located at memory address 0xE000ED08. VTO Contains the vector table settings. Default value is 0x00000000. TBLOFF Shows the vector table offset from Code or RAM. TBLBASE Indicates if the table is in Code or RAM. Refer to Interrupts and Exceptions (NVIC) for the set of available NVIC functions in CMSIS.